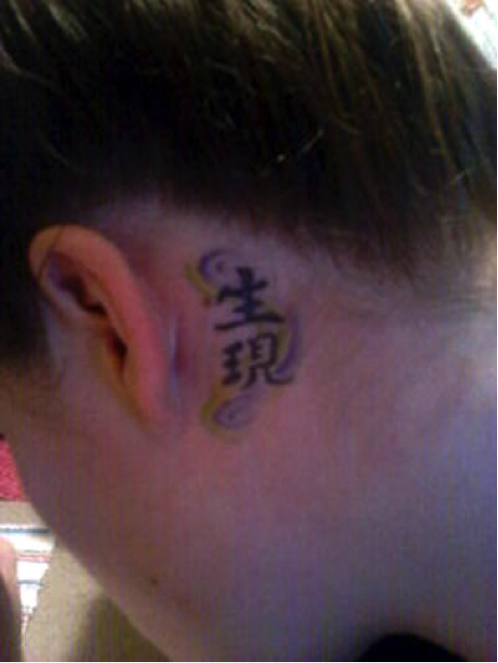 Having a tattoo in a Chinese can be pretty cool. It can make you seem exotic or cultured. “Can,” being the key word here. Frequent requests for tattoos include “Love,” or “Fate,” or “Happiness.” For some people, single characters like those are perfect, but there are others who want something a little more unique. Usually, that’s where the mistranslations hit. It’s not their fault for desiring a deep, unique, and meaningful tattoo. But when getting a tattoo in a language you don’t quite understand, always make sure to run it by someone who does. Sketchy English-to-Chinese guides in tattoo parlors aren’t your friend. Google Translate isn’t your friend either. We've gathered up a list of funny and cringe-worthy Chinese tattoo fails. Take a look below! Chinese characters that make sense separately do not always make sense when they’re stuck together. Despite the meaning of the separate characters, this combination does not mean “Live for Today,” “Live for Now,” “Carpe Diem,” or any other advertised meaning in tattoo parlors. It’s gibberish. 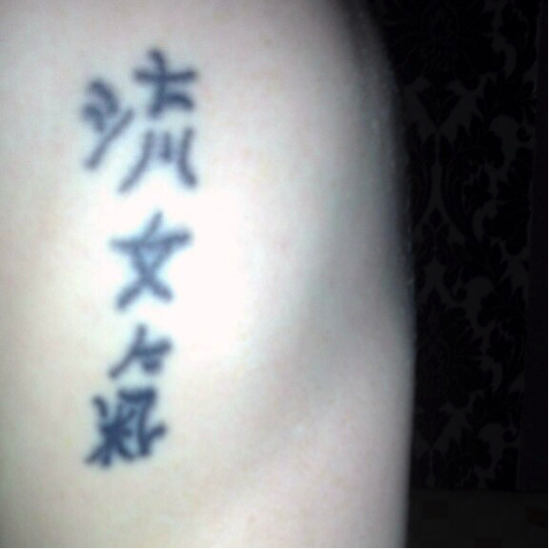 It looks pretty, arguably even artistic, but ultimately holds no deep meaning in Chinese. A Chinese translation for something like “take ahold of today/seize the day” would be “把握今日 (bǎ wò jīn rì).” The word 把握 connotes a certain determination behind the action, much more inspiring than the confusing concoction above. There are times when less is more. This is one of those times. "忘不了" implies that the memory, in this case that of a father, is unshakeable. Often it is used to describe a traumatic and influential event, or a particularly life-changing one. 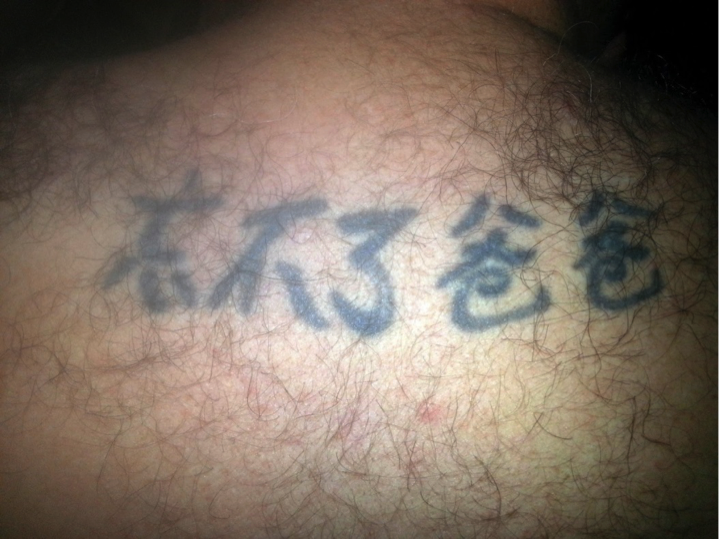 There’s not much wrong with the tattoo, per se, but having just "爸爸" would have sufficed for sentimental purposes. Having this tattoo is like getting a “I can’t forget about my dad” tattoo instead of getting just “Father/Dad/(Insert Dad’s Name)” inked. Although there are notable differences between Chinese and English grammar, the meaning of this phrase remains distinguishable, if incorrect. Sure, if your aim was for an inspiring, unique tattoo, you got it. But baring this to someone who understands Chinese will get you furrowed brows. Essentially, this phrase translates to “Destroy, must not.” If “Unbreakable” is what you’re going for, the phrase “牢不可破 (Láo bù kě pò)” would be more appropriate. 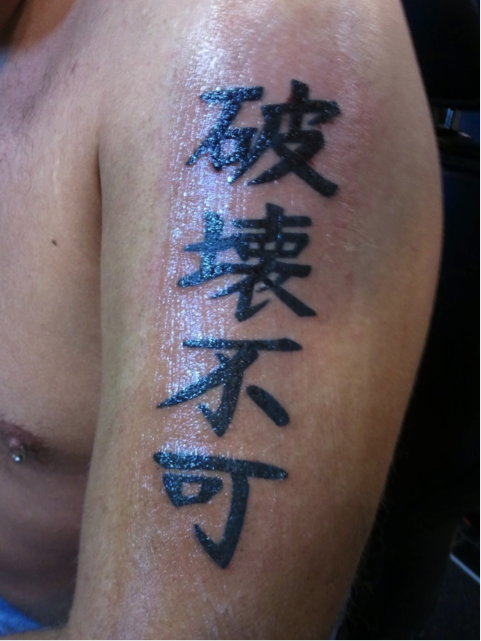 “牢” implies durability and tenacity in both physical and mental aspects. Grammar just got thrown out the window and is demanding to be let back in. It felt completely neglected by this combo. Does this phrase mean “circulating female spirit”? “Flowing woman gas”? The interpretations are endless. Sticking this into the almighty Google Translator to see if it shows why this tattoo was gotten doesn’t help much either. “Female gas flow” was the answer it spat out. What is that? Perhaps they’re on to some female secret that we don’t know about. 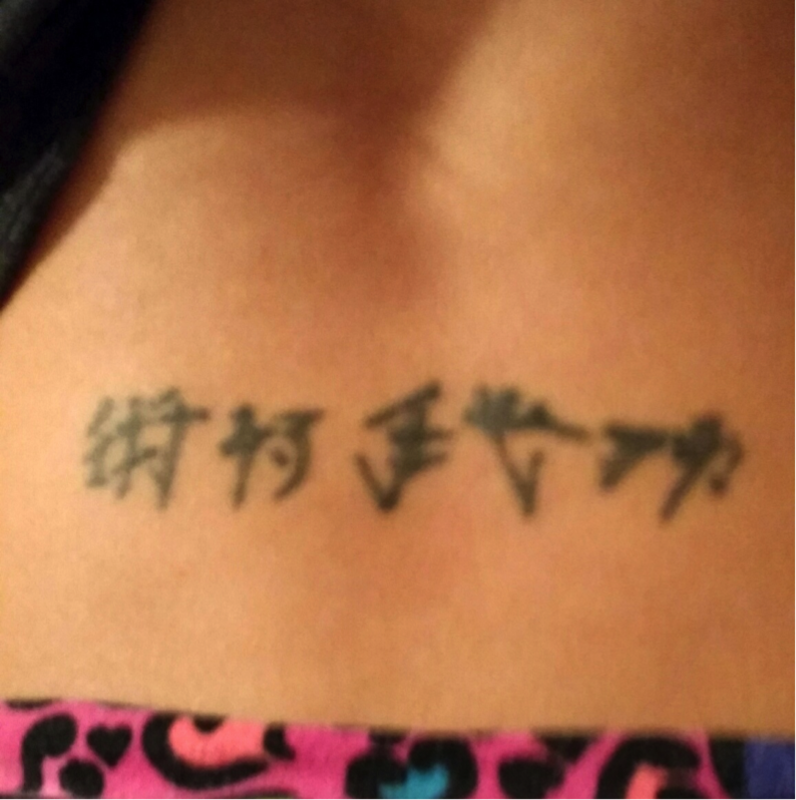 But seriously, in the future have your Chinese tattoos proofread by someone who understands Chinese. You labeled yourself a “Bitter Idiot.” While that fact may be true, but it’s not pleasant to have as a permanent reminder. To make it worse, the characters aren’t even all facing the same way. "苦" is upside down. On the bright side, the characters are all written nicely and correctly, so props to whoever tattooed this. Perhaps it’s a code, or maybe a strange blend of symbolic figures. Is it alien language? Or is it an artistic interpretation of Chinese script? The first character looks like 術/术 (shù), which means “technique,” and the last character somewhat looks like 功 (gōng), meaning “power.” The third and fourth can either be a horribly constructed 我 (wǒ) or two separate mystery characters. Not even going to try guessing what the second character is. 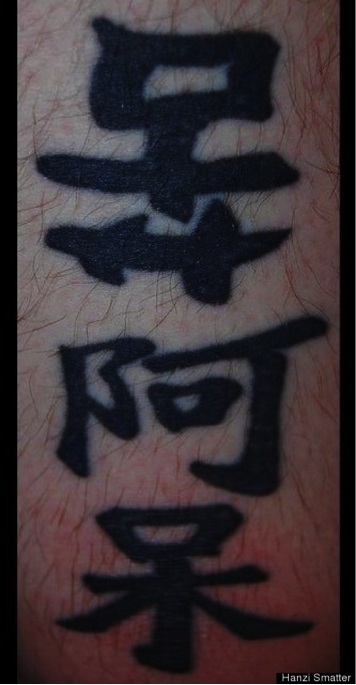 If anyone has any idea what this tattoo is supposed to say, feel free to tweet us @TutorMing. Having a goal is great in most situations. It’s just a bit unsettling to see that murder is a checkpoint on this person’s path to success. Asides from that, there are also several mistakes with this tattoo. There are wrong strokes in 殺/杀, and missing strokes in成. Although what the first three characters represent can be inferred from their structure, they’re still all written incorrectly. From form to strokes to lines popping out here and there, the tattoo artist has moved beyond artistic rendition and into the territory of writing faux Chinese. It’s like they took a chiseled tipped marker and fiercely freehanded this on their human canvas. While blindfolded. However, thanks to the artist, the world may never know what paramount goal requires human sacrifices along the way. 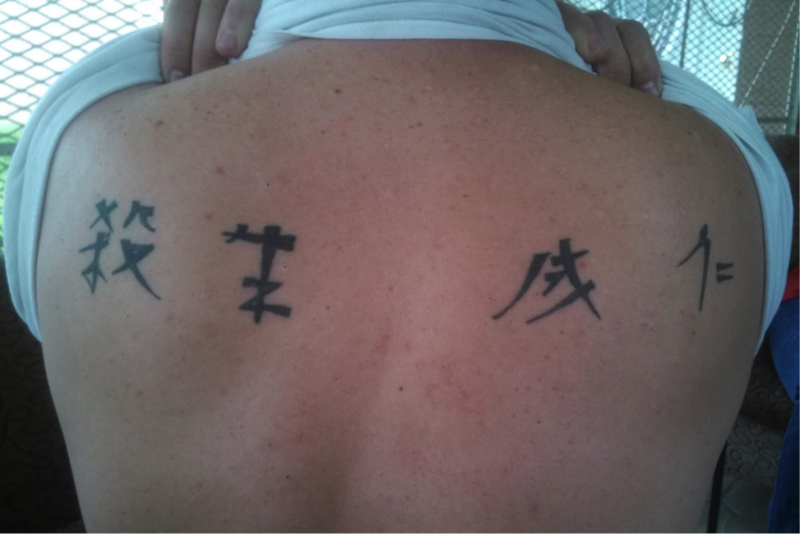 In conclusion, if you insist on getting a Chinese character tattooed onto your skin, please do your research first. Consult a Chinese speaker to avoid the mistakes above. Founded in 2004, TutorGroup, the parent company of TutorMing, created the first commercially available synchronous learning portal in the world. TutorGroup offers TutorMing for Chinese learning. For English learning, it offers VIPABC, TutorABC, and TutorABCJr. The company is backed by Alibaba, Softbank, Temasek, and Qiming Ventures. 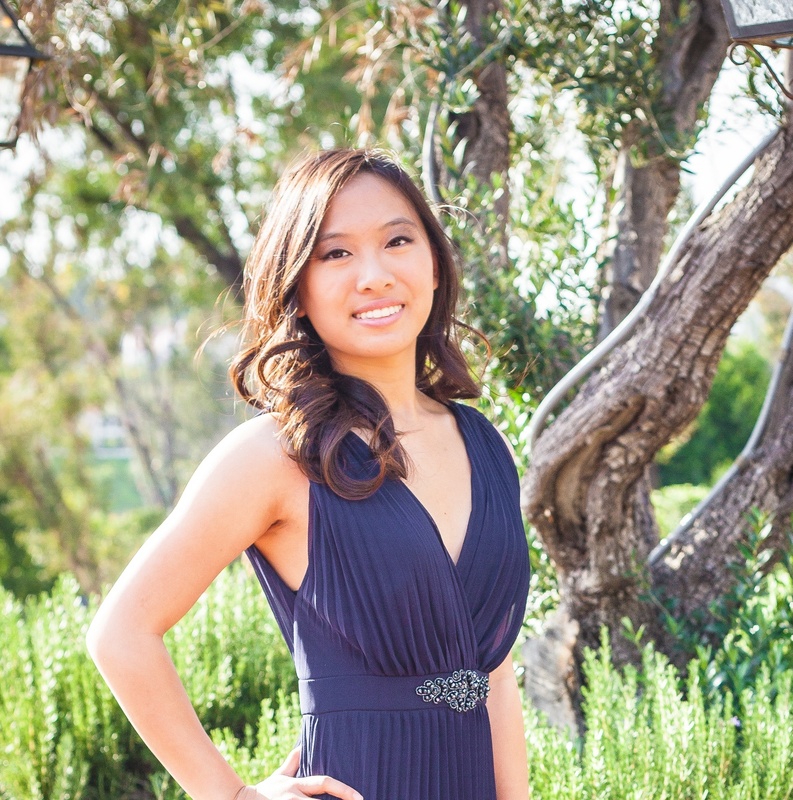 Angela Fang is a contributing writer at TutorMing. Born in New Jersey, she decided to go to University of California, Berkeley, to get her degrees in Economics and Math. In her free time, she enjoys napping, surfing the Internet, and playing the violin. Corgis are her spirit animal.